To be identified as a “fun” mom would probably send me into a rarely occurring giggle fit, if my kids have ever seen me have one. Yes, it’s that bad. “Fun” is absolutely not my middle name, but insert “Serious” and my kids will know exactly which parent you’re talking about. My Husband is the absolute life of our family and at times, the most fun Dad in the neighborhood. He is the one that chases the kids friends all over the backyard, makes up silly voices during story time, has dance parties with our kids and plays hide and seek with our littles until he has hidden so well they think he’s abandoned them. My heart melts when I see that my kids have a Daddy cool enough to have crazy, awesome, fun with them. I know God has put him on a team with me for a reason. I know I add strengths to our family as well. I have a very nurturing heart and am more likely to fret over the baby crying, worry over a sick child or cuddle up with the kids for a good read-aloud. My kids know I am a lover of beauty and seeker of adventure, they look forward to our times together when we go capture ours. I keep them educated, things in the house are pretty clean and I feed the family pretty great food. After all if it were all up to my husband we’d probably have to burn the dirty house down after 1 year and the kids would quite likely get bored eating Macaroni & Cheese for dinner every night. So it’s a good thing I’m here keep things in line! So here we are at Homeschool Convention last weekend and can you imagine? My biggest takeaway from the entire weekend is this: TO HAVE MORE FUN. Yes, really. I was stricken with conviction all weekend over the fact that as much as I long for my husband to keep things a bit(okay a LOT) cleaner, him & my kids long for me to loosen up and smile more. I realize this makes me sound terrible but I promised transparency here and this is the honest truth. I do not have enough fun with my family and I have never been more determined to change it. Time is only going to keep passing us by, we’ve got to capture these moments before they disappear. 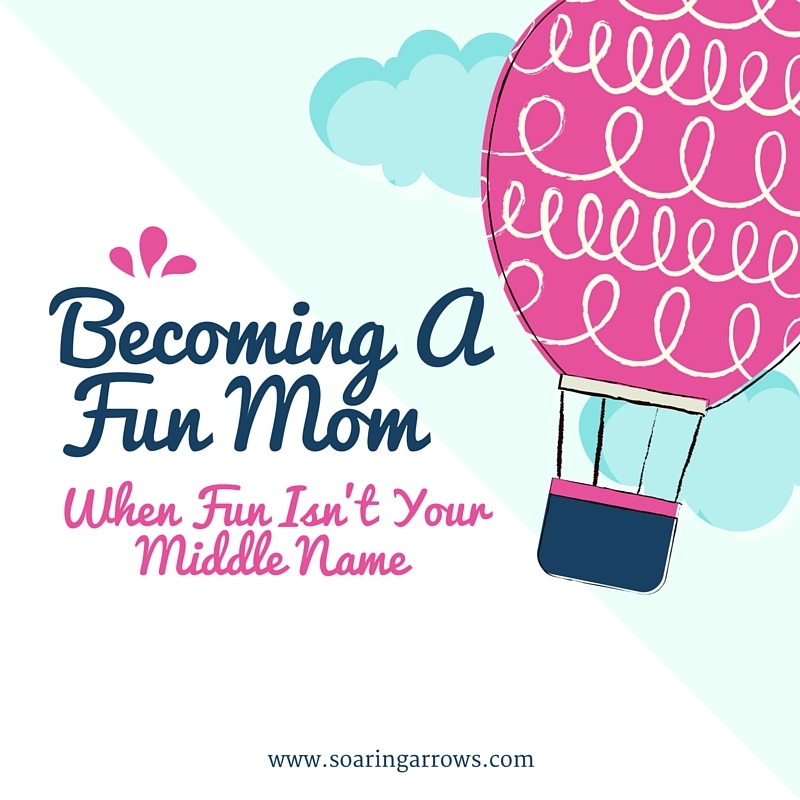 How can Serious Moms strive to become Fun Moms? Over the last few days I attempted to focus more on my littles and back off on the chores I do all over the house. It was fun in theory, after just two days our house was a pretty disorganized mess. Now I am truly not a fun Mom when our house is messy so that wasn’t going to work. Then I realized, I am doing too much of the work on my own. In order for this to work, the entire family will have to chip in on the housework so that I can be freed up to lighten up as the moments present themselves. I have younger kids but there is a lot more they can do to help out, which will help me to chill out. Sit them down and explain what you’re working on, I’ll bet they’d be happy to chip in knowing you are trying to make a difference in the atmosphere of your home! We keep hearing this message right? Yet the temptation is so strong to do our own thing, pick up that device or tune out the 100th question of the day. I totally get it! Quiet time is something I long for all day, but now I am going to manage my time better. In the morning I plan either taking my kids to do something fun or working on my household tasks and staying focused on engaging my littles. Talk with them. Make eye contact. Listen to them. The afternoon will be set aside guilt free for Mommy Time, because I truly know I need it. I will have made that connection with my kids throughout the morning so they will know I was intentional in spending time with them. Our kids are growing up in a generation of parents and people in general, who don’t know how to turn their faces away from their devices. I am certain this will be pain they will carry into adulthood if we don’t do something about it. What could make a Mom of our generation more fun and awesome than putting our smart phones away for even a few hours a day? I am certain it will go a long way in the heart of your child. This starts by opening my heart to God. When I immerse my heart and mind into the Word of God I don’t have to try to be beautiful, I just am. No make up required! My husband sees it, my kids see it, the light of Christ shining out of me. When I am feeling beautiful on the inside the fun just overflows out of that. It is natural! Making time with Jesus is crucial to becoming a fun Mom and I hope each day I get better at making this time the top priority of my day. Hospitality is a spiritual gift I knew I had from the time I was a teenager. I adore making people feel warm and welcome in our house especially with delcious food! It is easy for me to think of this when it comes to entertaining, however I am realizing it’s time for me to transfer this over to ways I can be hospitable with my kids and their friends. As they get older I want our house to be the “Go To” house. I’m sure we all had one we hung out at when we were young. I know I did! I want to be that house! So over the Summer I hope to work on looking for ways to show my kids that our house is that house. It’s often as simple as inviting friends over last minute, having a batch of cookies or popsicles ready or some lemonade available for thirsty kids playing in the hot sun. It’s also my kids being convinced that their Mom is a fun Mom, right? Nobody ever wanted to visit the friends with the “serious” mom. True Story. Let’s bring fun back to Motherhood and give God the glory. What are ways you add fun to Motherhood? The good news is, we are all in this together! Are you in the periscope group http://www.homeschoolscopes.tv? It has encouraged me so much. I have not heard about that. Hope to Check it out. The main problem is time. So many great resources, so little time☺. Love this Melissa! Whenever I read your posts I am reminded how similar we are! One thing I try to do is make silly jokes, both to my kids and my husband. It helps to keep the mood light and fun. 😉 I tell knock knock jokes, or dance in silly ways to make the kids laugh. Aww I feel the same way when I read your posts! That is an excellent idea! Sometimes I make up songs just get get them distracted. Great post! I like all the advice. I have to enlist help and get ideas regularly. I like our house busy, but run out of ideas. Thank you! You are welcome! Thank you for reading and commenting! As the years of motherhood tick by so quickly, this is a great reminder. I used to be fun all the time. Always thinking of ways to make my kids smile and laugh. I need to tap into that part of me more again, cause I think I’ve lost a little bit of the fun along the way. Oh Girl I know I have lost some of that spark! It happens but the important part is getting back on track. So glad we are all in this together! I will never try to bridge the generation gap or let it be at the sake of losing my respect as my kids mother. However I don’t want to be cold and boring either. I just notice a pattern with those Mom’s that their kids aren’t the ones rushing back to visit when they are grown. I want to be the kind of Mom my kids are excited to visit when they are adults! I think it is important to have fun with your kids. I am like a big kid myself so me and my son are always having fun.